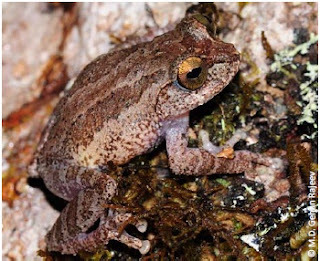 Sri Lankan researchers have identified and described eight new frog species from the Peak of Wilderness sanctuary region which comes under the Central Highlands World Heritage Site in Sri Lanka during an amphibian survey in the island nation recently. According to a research paper published in the Journal of Threatened Taxa, all the newly described frog species belong to Pseudophilautus genus of Sri Lankan endemic frogs. According to the researchers who have conducted the study, all the new frog species has a combination of unique features which make them distinctive from other known species of the genus and easily identifiable in the field. Since the records are new and many of them are spotted from only one location so far- from the sanctuary situated in the Ratnapura district in Sabaragamuwa province of the island nation- all the new species except one(Pseudophilautus newtonjayawardanei) is considered as Critically Endangered as per IUCN criterion, says the paper. Organisms with an extent of distribution of less than 100 square kilometers in habitats under severe threats are categorized as Critically Endangered categories. Bambaradeniya’s Shrub Frog (Pseudophilautus bambaradeniyai), a small sized frog, found in forests at elevations ranging from 750 to 1400 MSL, usually rests on the forest floor or on shrubs with a height of about 1.5 meters, says the study. This frog inhabits lowland rain forests and lower montane rain forests. Apart from a dark brown dorsal area with black blotches, this frog has and a blackish cross between the eyes. The off-white stripe on the back is also very prominent in this frog, according to the study. However, the colour of dorsum may change to orange to lighter brown while the thickness of the line on the back may vary from organism to organism. The species was named bambaradeniyai, after Channa Bambaradeniya, a wetland scientist, for his extensive works to wetland conservation and conservation attempts. 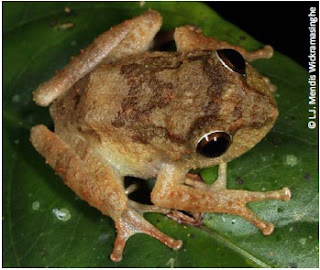 Dayawansa’s Shrub Frog (Pseudophilautus dayawansai), is a small bush frog with blackish brown colouration. Its colour pattern is very different from its close relatives. Sometimes, the blackish brown tint can vary from reddish-brown to lighter brown shades, according to the paper. The most preferred habitat is cloud forests at an elevation of 1550-1900 MSL. They are usually found on the forest floor or on bushes of up to 2 meters height. 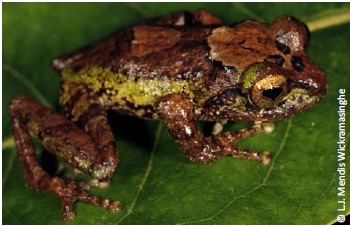 Apart from several morphological differences, the frog species also reportedly has three prominent blackish-brown circular spots among which two are situated between eyes. The frog was named after Nihal Dayawansa, a senior lecturer in the University of Colombo for his contributions to amphibian research in Sri Lanka. Another newly described species, Pseudophilautus jagathgunawardanai, has a combination of different morphological characters which makes it different from its close relatives. 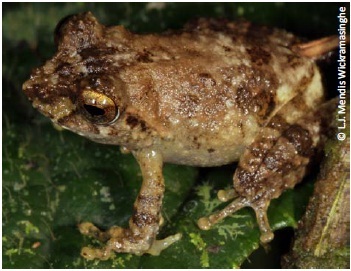 With the unique patterns and markings on the dorsum of this light brown frog with a greenish tint, P. jagathgunawardanai is also an inhabitant of cloud forests at 1600 to 1750 MSL elevations, like P. dayawansai. Though it may be spotted on the forest floor, these frogs often prefer to be on tree trunks with lichens. Named after Jagath Gunawardana, a Sri Lankan naturalist for his conservation efforts, the frog is also known as Jagath Gunawardana’s shrub frog. 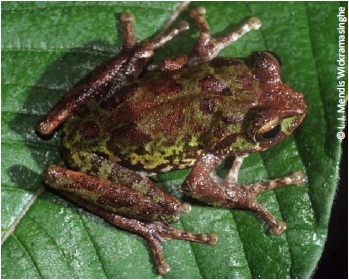 Yet another new frog species, Pseudophilautus karunarathnai, has unique colour patterns which make it easily identifiable in the field. Named after Y.G.P. Karunarathna, retired Assistant Director of Sri Lankan Wildlife Conservation Department, for his efforts to bring down human-wildlife conflict, the frog has a dorsal portion of uniform cream colour with dark brown or light brown blotches and a dark brown cross between the eyes. 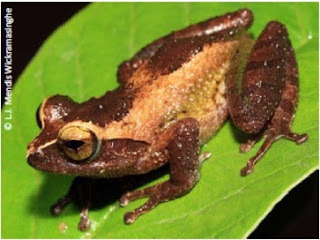 Known as Karunarathna’s Shrub Frog, it is found in lowland rain forests and lowland montane rain forests. It either rests on forest floor or on shrubs of 1.5 meter height. Interestingly, this frog species can also be found at places with less canopy cover, like home gardens, says the study. Pseudophilautus newtonjayawardanei, is a bronze coloured frog with dark brown patches and an off-white vertebral stripe on its body. The species has a pair of broad dark brown longitudinal dorsal bands which starts from the back of the eye running to the groin region. Named after surgeon naturalist Newton Jayawardane, it is found in forest canopy in high altitudes. The researchers were able to find just two specimens of this rare frog which usually sits on leaves of trees with 8 meters height at forests of 1800 to 2000 MSL elevation. Pseudophilautus puranappu, the only one among the newly found to be named after a freedom fighter, is named to honour Veer Puran Appu who revolted against the British colonial forces in the pre-independent days of the island nation. 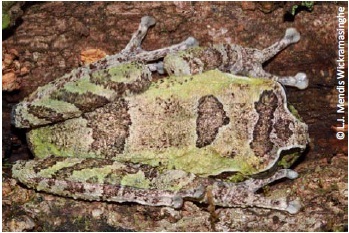 The frog species has a unique faint stripe between eyes with light greenish tinge on laterally. The species also has a maroon coloured hour-glass shaped broad patch running from snout to vent. Also known as Puran Appu’s shrub frog, the species can be seen perching on rocks under shades during day time. They can be also found on bushes with 1 meter heights during night. They can be found in forests of elevation ranging between 1800 to 2100 MSL. The newly christened Samrakoon’s Shrub Frog (Pseudophilautus samarakoon) has a very prominent dark brown ‘M’ shaped patch on its anterior which makes it distinct in the field. Moreover, it has a dark brown band between the eyes. Moreover, there is a combination of other morphological differences which makes this frog distinctive from its close relatives. This new species got its name from the Assistant Director of the Wildlife Department, Ananda Vijith Samarakoon for his efforts to orient the wildlife officers training to optimize the conservation efforts. Found at elevations of 1000 to 1400 MSL, Samarakoon ‘s shrub frog inhabits lower montane rain forests and prefers to perch on bamboo plants near forest streams or on shrubs with up to 2 meters of height. These species can be found along with P. bambaradeniyai sp. and P. karunarathnei sp. According to the researchers, the frogs can be easily found in abundance near the starting point of Kaluganga River. Pseudophilautus sirilwijesundarai, is a multi-coloured frog with dark brown dorsal area with greenish tinge and maroon blotches. It has prominent maroon cross bands on its fingers and toes. Named after Siril Wijesundara who is the Director of Royal Botanical gardens, Peradeniya, Sri Lanka, is again inhabits montane cloud forests of 1600 to 1700 MSL elevation. These frogs, according to the researchers, are usually found on the canopy on tress of even up to 10 meter tall. They are often found with mosses, says the study. However, there are multiple threats to the endemic amphibian fauna in Sri Lanka, say the researchers. Sripada Peak, the area from the newly described species are reported is a major pilgrim centre. The pilgrim tourism in this area and the resulting garbage and pollution is seriously damaging the fragile ecosystem of the area. Moreover, illegal gem mining on the banks of the Kalaganga River and illegal felling of trees in the forests to expand the adjoining tea plantations also is a major threat to the endemic amphibian diversity in the area, says the study. 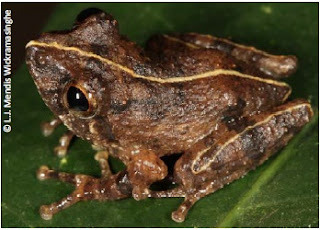 Pseudophilautus is a genus of amphibians which include direct developing rhacophorids (also known as bush frogs or shrub frogs which are found in Asian and African regions). However, concerns are rife that the genus is facing survival threat as almost 17 species of the 65 species known from the genus are never again recorded after their initial discovery and are considered as already vanished. According to researchers, this rich biodiversity spot may still have organisms yet unknown to science, since the population surveys in these are scarcely conducted due to difficult terrain, heavy rainfall and inaccessibility. L.J. Mendis Wickramasinghe, Dulan Ranga Vidanapathirana, M.D. Gehan Rajeev, S. Chathuranga Ariyarathne, A.W. Amila Chanaka, L.L. Dharshana Priyantha, Imesh Nuwan Bandara and Nethu Wickramasinghe of Herpetological Foundation of Sri Lanka, Hendala, Wattala, Sri Lanka have co-authored the study.